Chiron is the son of Philyra, a nymph and daughter of Oceanus and the Titan, Cronos who were horsing around and then really horsing around in the forms of horses so Cronos could hide his affair from his wife, Rhea. So naturally of course, later, when Chiron is born, he has the upper half and body of a man and from the waist down, he has the body of a horse. Philyra on seeing her half horse, half human son, abandoned him and he was raised by the other gods of Olympus. Chiron is also the god Zeus’s half-brother. Having a parentage different than all the other centaurs, who were born from Ixion and a cloud, Chiron is known for his great wisdom and gentle temperament. Unlike the other Centaur who are known for their wild and reckless behavior. When the other Centaurs were created, Chiron and his daughters took them in and raised them as their own sons. Chiron was learned in many arts such as medicine, music, gymnastics, literature, prophecy, strategy, hunting and warfare. This is usually attributed to his being taught by the gods Apollo and Artemis. Along with his wife and children, Chiron lived in a cave on Mount Pelion in Thessaly where they had been banished to with the other centaurs by the Lapithae. Sacrifices were offered up to Chiron there by the Magnesian people. And the family known as Cheironidae was well known for their knowledge of medicine, that they were thought to be descended from Chiron. In Athenian vase paintings, Chiron is depicted with the full body of a man, from head to foot, wearing chiton clothing and boots, with a horse-body attached to his human rear. This image probably reflected Chiron’s appearance in Greek drama, where costume limitations would have affected his depiction for the stage. This limitation however doesn’t seem to have affected the appearance of other Centaurs in their familiar half human, half horse forms. With his divine parentage, yes, Chiron started out as a God of Healing. Later when this mythology is subsumed by the Greeks, he becomes one of the centaurs. He was known as a great healer, astrologer and a well respected oracle. Chiron was the first to use herbs for healing and the medical practice of surgery. Chiron’s name is derived from the Greek word for hand (kheir), which also means “skilled with the hands.” The name is also closely associated in myth with the term kheirourgos or surgeon. And that makes sense when seeing how Chiron is the first surgeon. Chiron married the nymph Chariclo and with her, they had many fine colts and fillies. Among their children are Hippe (also known as Melanippe, the “Black Mare” or Euippe, “truly a mare”), Endeis, Ocyrhoe and Carystus, their only son. Through his daughter, Endeis, Chiron is the grandfather of Peleus. The family known as Cheironidae was well known for their knowledge of medicine, that they were thought to be descended from Chiron. Chiron’s reputation as a teacher is so great, that he is said to have taught many students throughout his career. Though a lot of this may be poetic license and a desire on the part of any historians, story tellers, theologians and chroniclers wanting to attribute a Hero’s greatness to lessons and skills learned from Chiron. Achilles, Actaeon, Aeneas, Ajax, Aristaeus, Asclepius, Caeneus, Jason, Medus, Patroclus, Peleus, Perseus, Telamon, and Theseus. 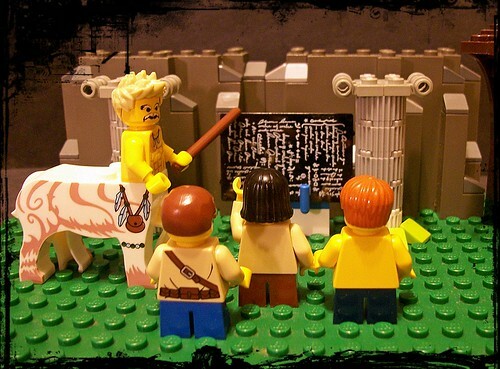 Sometimes Heracles, Oileus, Phoenix, and even Dionysus were said to have been students. Chiron’s friendship with Peleus, who is also his grandson, is of note. Chiron saved him from the hands of the other centaurs, which were on the verge of killing Peleus. Acastus had left Peleus out in the woods, hoping the centaurs would kill him. Chiron also returned Peleus’ sword to him that Acastus had taken and hid. Chiron further aided Peleus in marrying the goddess Thetis, telling him to hold tight to her as she changed forms numerous times. Chiron is also connected with the story of the Argonauts, whom he received kindly when they came to his residence on their voyage, for many of the heroes were his friends and students. Chiron’s death comes when he was accidentally hit by a poisonous arrow coated in Hydra-venom shot by Heracles. This came about as Hercules, during his fourth labor in defeating the Erymanthian Boar, came to visit another centaur friend Pholus on Mount Pelion. While at dinner, Hercules asked for some wine to drink. The only wine that Pholus had was some sacred wine given to him by the god Dionysus. At Hercules’ insistence, Pholus was forced to bring it out and when Hercules grabbed it to drink, the aroma of the wine lured the other centaurs to the cave who became intoxicated by just the scent of it. Led by Nessus, the other centaurs soon began to riot and attacked the cave, throwing rocks and trees at it. In self-defense, Hercules began to start shooting arrows, all poisoned by Hydra blood, to force them back. Eventually the centaurs ran to Chiron’s cave over in Malea. It is there, that Hercules shot the fatal arrow that strikes Chiron. The potency of the poison is such, that even Chiron the master healer is not able to heal himself and the pain is more than he can bear, that Chiron dies despite being immortal. Here, there are a few different variations of this story. Chiron dies, giving up his immortality in a bargain with Hercules and Zeus so that Prometheus can go free and humankind can have the gift of fire that was originally stolen. Other versions of this story state that Pholus also died as when he came out of his cave, he pulled one of the arrows that Hercules had shot from a dead centaur and in the process accidentally drops the arrow on his hoof, killing himself that way. Sometimes the story goes that it is Chiron who accidentally drops the poisoned arrow on his hoof. All versions do agree that Chiron dies of the poisoned arrow, regardless of it being accidentally dropped or shot. After his death, Zeus placed Chiron up among the stars where he becomes the constellation of Sagittarius or Centaurus depending on who is telling the story. Yes, Chiron has a celestial body named after him. These celestial objects are known as centaurs, as they have characteristics of both asteroids and comets along with having unstable or transient orbits. Something of a composite nature just like their namesakes. Chiron was found in 1977 by Charles Kowal. At first astronomers weren’t sure how to classify these centaurs or what to call them due to their unstable orbits and conflicting natures. Chiron isn’t to be confused with a hypothetical moon of Saturn that has long since been disproved. Some Western Astrologers have readily jumped on to the discoveries of new celestial objects within our solar system, adding them to the classical Astrology and coming up with meanings for them. One such interpretation is that Chiron is “the wounded healer” and has associations with life traumas, bullying and wounds or inadequacies that are seen as incurable but can still be overcome or worked with. Basically this is turning a weakness into a strength. A few astrologers believe that Chiron should be assigned as the ruler of Virgo.